About 10 years ago, conversion marketing and landing page optimization were similarly popular topics. But recently, conversion marketing has pulled away in popularity. If you click on the chart above, it will reveal a larger version. As you can see, conversion marketing started out more popular. Then came the rise of the landing page. In August 2008, they both had a comparative search index of 24 (a number relative to the peak popularity of both search terms over this time frame). But since then, conversion marketing has pulled away in popularity. 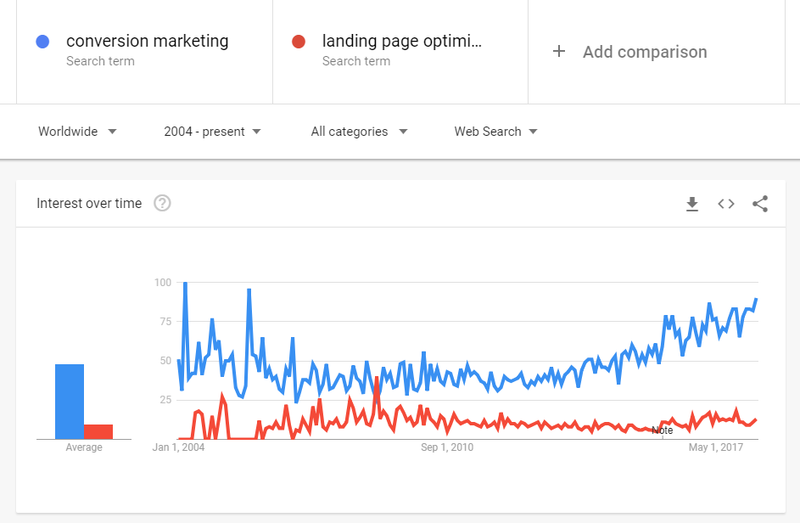 In May 2018, conversion marketing had a comparative search index of 87 with landing page optimization at 14 (Data Source: Google Trends). Let’s take a quick look at what each of these terms means, and why landing page optimization is essential to the successful marketer. Explaining marketing terms is tricky. They’re not like science terms. A neutron is a neutron no matter what. Marketing terms tend to slightly vary based on a marketer’s experience, their goals, what tools they use and what vendors they listen to. So I’m not going to present this as an official conversion marketing definition, it’s just a quick explanation of the term. Conversion marketing is the practice of improving conversion rates for marketing, also known as conversion optimization. It applies to many types of marketing, from email marketing to pay-per-click ads to, yes, landing pages. So, for example, if you’re trying to improve your email marketing conversion rate, that is conversion marketing. Landing page optimization fits under this umbrella as well. Landing page optimization (LPO) is essentially landing page conversion optimization, a subset of conversion marketing. 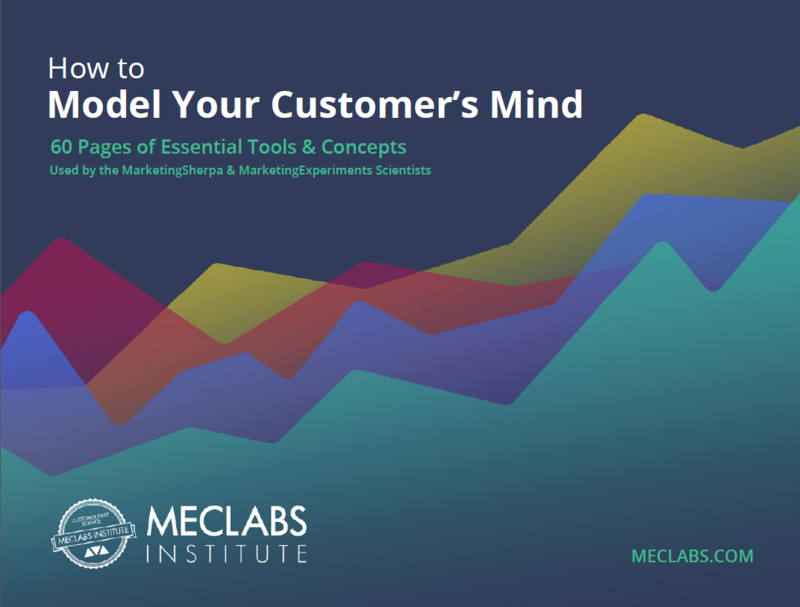 At MECLABS Institute, we suggest you follow overall principles instead of a specific best practice and then test to discover what works best for your ideal customer. 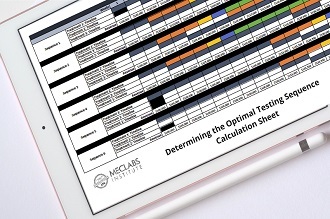 We’ve even created a patented methodology — the MECLABS Conversion Sequence Heuristic — to help you come up with hypotheses for your experiments you can then test using landing page optimization tools like Optimizely, Google Analytics Experiments, Adobe Target and the like. As I get older, the decline of many things saddens me because I view them as a negative harbinger of things to come. A parking lot that used to be a primordial forest. Print journalism. My hairline. Glancing at that Google Trends chart, I’m afraid I may add landing page optimization to that list. Because in 2018, just like in 2008, the landing page is still the heart and the soul of the buyer’s journey. Yes, there’s voice search. And mobile apps. And texting. And tweeting a pizza emoji to Domino’s to order a pizza. But most people still want to see what they’re buying and not just trust a disembodied voice. Mobile apps are a closed universe. And most SMS promotions, including Domino’s tweet ordering gimmick, begin by sending you to a landing page anyway. Regardless, this whiz-bang future technology is only on the margins. Where the money is made and where the money is spent, a landing page is usually involved. Think about it. Display ads. Pay-per-click text ads. Search engine marketing. Social media advertising. Email marketing. Where does the call-to-action often lead? To your landing pages. And the landing page’s centrality to marketing conversion isn’t limited to digital advertising. TV commercials. Print ads. Radio ads. Out-of-home advertising. Most of this investment leads to a landing page as well. Yes, some ads are just for branding. And some include a phone number. But the vast majority of ads lead people to a landing page — $591,070,000,000 spent on advertising in 2017, and a landing page is often used to ultimately cash in on that investment. And that doesn’t even include activity that doesn’t require paid media like email marketing, organic search, content marketing, social media marketing and the like. Even if your SEO is focused on getting customers from the search engine results page to a content article, that content article likely has a link or other call-to-action to a landing page for a white paper download, direct purchase, etc. 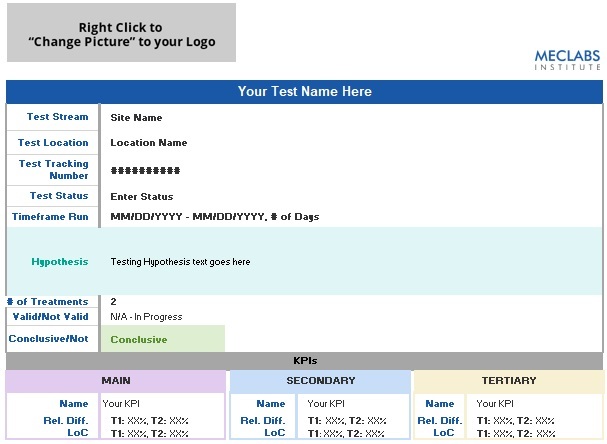 If LPO is a subset of conversion marketing, why is it important to recognize it as a distinct practice? Well, why does a football team have a placekicker and a punter? Why do you go to a cardiologist for serious heart problems and not just a general practitioner? Marketing is a subset of business, why have marketers? Focus outperforms generality every time. Because a lot gets lost in that giant general bucket. And since landing pages don’t require a distinct budget, unlike paid search engine marketing, for example, it can get overlooked and lumped in with marketing in general. Or even the IT department. Last time we asked about website optimization tactics, only two-marketing experiments large companies said they implement unique landing pages for various marketing campaigns or brands (64% for large, 67% for medium), and less than half (42%) of small companies did. And only half of companies optimized design and content for conversions (44% of large, 50% of medium, 53% of small companies). I’ll give you a specific example. I was in a Peer Review Session recently for a Research Partner with MECLABS Institute (parent research organization of MarketingExperiments). They buy search engine marketing that drives people to their website. But when we looked at where this paid traffic was heading, there was one very general mobile landing page version and one very general desktop landing page version for all the keywords they were buying (more than 1,000). Is it really an optimized landing page then? These aren’t just keywords really. They represent customer motivations. The motivations of real people. Their hopes and dreams. Their fears and anxieties. If you’re engaged in active listening with a real person standing in front of you who is excited or scared, you repeat back what they say to you, so they know they are being heard. Why should you do anything else just because there is a search engine and a computer or mobile phone involved? That’s still a real person expressing real desire and distress with their search activity. Don’t hit them with a general marketing message, serve them with a relevant communication. And test that communication to discover what really works best for those customers. I’m not picking on this particular company. It’s just a fresh example in my mind since I saw it yesterday. The company was heavily involved in conversion marketing. They had an Excel document with eight spreadsheets — one with more than 1,000 lines — with all sorts of performance data (screen size, day of the week, etc.) for Google, Yahoo and Bing search keywords. They’re clearly working hard to optimize the performance of that significant search engine marketing spend. But when it came to landing page optimization, not so much. 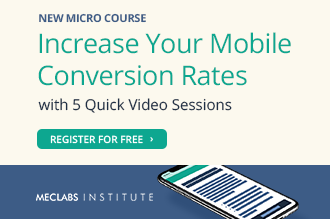 At the time they launched these campaigns, my guess is they just found a landing page or created a landing page for all their SEM, checked that off the list, and then focused on the conversion marketing they assumed mattered most — the SEM keywords. And that’s where a lack of focus on the landing page can hurt you. It would be like optimizing a storefront to entice customers to come in. Window displays created by local artists. Solid oak doors with gold-plated handles. A beautifully designed sign with the store name. Free samples out front on the sidewalk. But then when the customer walks into the store where the decision is actually made, the inside is a discombobulated mess that looks like a teenager’s bedroom. Yes, conversion marketing to drive traffic is important. But don’t lose focus on the key customer decision point — the landing page.